The Elliott Inn is the newest production from the team at Elliott Street Deli and Pub! 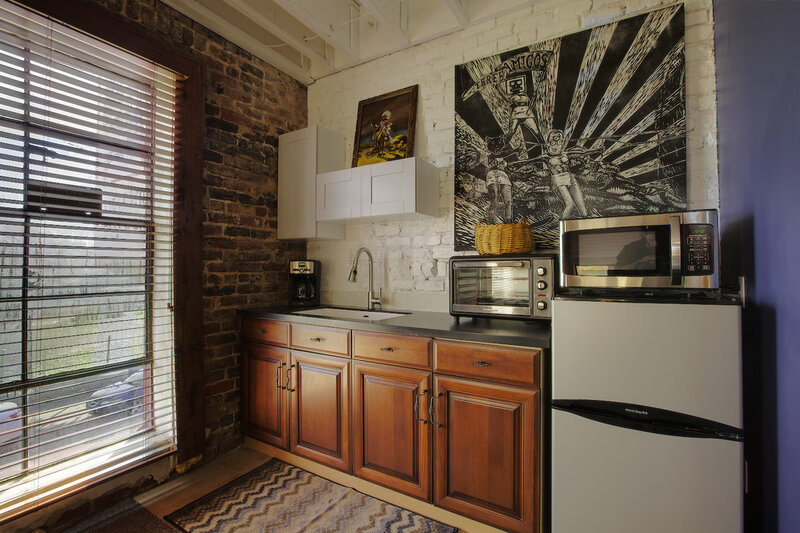 Now you can stay in this historic 160-year-old building - one of the oldest and most unique in the entire city of Atlanta - lovingly restored by the Jakob brothers, first as their home for the past 13 years and now for you! We look forward to having you stay with us - and your first round is always on us! 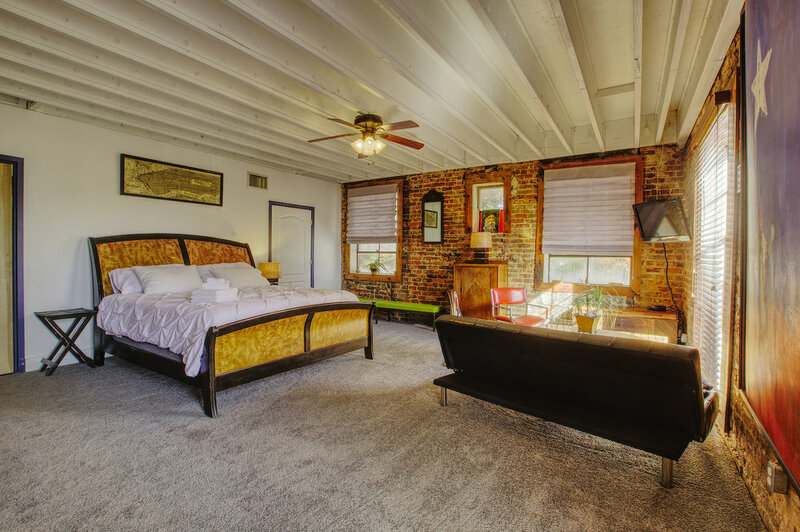 We’re thrilled that you’re interested in staying with us in this historic and legendary space. As a bit of background…our building was built around 1864 and stands as one of the oldest buildings, in one of the oldest parts of Atlanta. 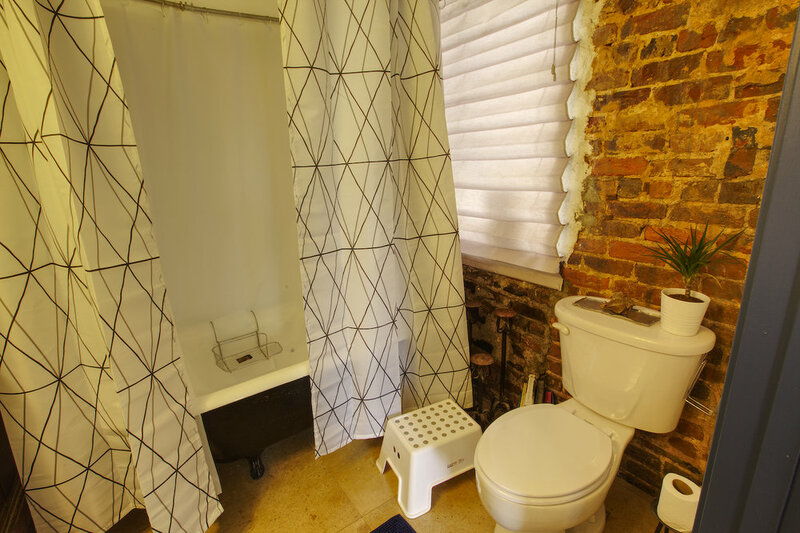 The founding of the city – once known as both Marthasville, then Thrashersville, then Terminus before being named Atlanta – literally happened right here, and in the streets and buildings around us in downtown and Castleberry Hill. 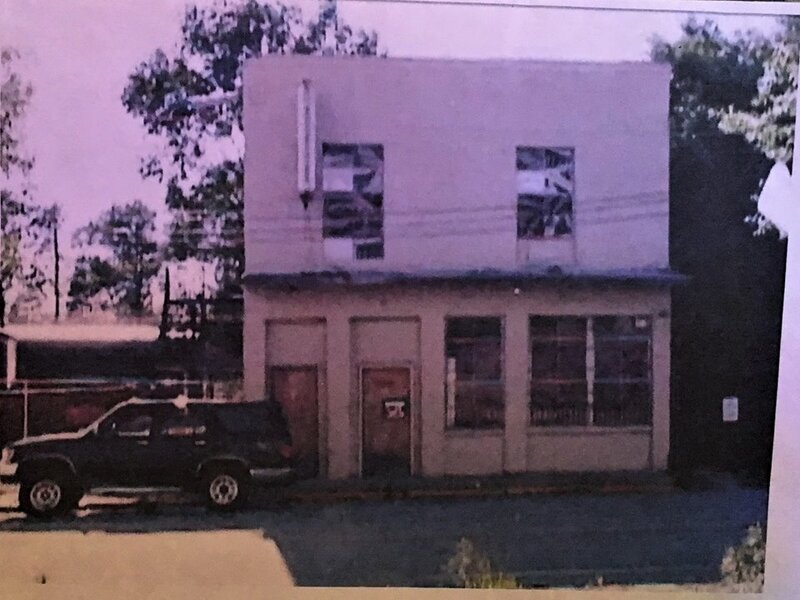 The current Elliott Inn is housed in a building which the Brothers Jakob bought in 2004 and in what they opened what is now the Elliott Street Deli & Pub, in 2006. 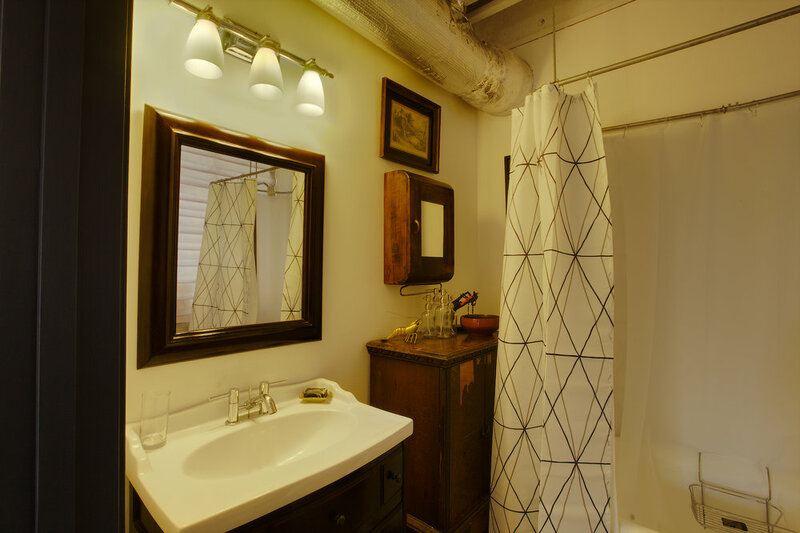 The Brothers bought the old dilapidated rundown building and subsequently renovated it into the space you see today, by hand. The original ESP building as it stood in 2004. They restored all the walls to its natural brick; they repaired the 200+ pieces of glass in the original 1950’s window frames; they installed all new wood floor joists on every floor - which had to be done due to a bad fire that started in the early hours of New Year’s Day 1992. The fire burned most of the interior of the structure - and yes, Fire Station Company 1 (located just next door to the building) put it out. The fire ultimately closed the original bar which was in the building - once called `The Bird Cage’ (circa 1950-1980) then called `Dee’s Bird Cage’ (1980 ish-1992). After the fire, the building sat vacant and damaged for over 10 years, deteriorating, until it caught the Jakob Brothers eyes. After more than 18 months of careful, constant work which required meticulously taking each piece of the building apart and rebuilding it, it lives as what you see standing today. Not knowing the history of the building prior to buying it, the Brothers sought out details of its past while building its future. Over the last 13 years of operation many people have come in to tell us of “the former going on’s” at 51 Elliott Street. People whose families used to own the building in the early 20th century would come in with photographs and share stories and each of them would give us a little more history to fill in our own story - and to tell us about the incredible musicians who filled our stages with music when it was the Bird Cage (s). Original Terminus Station with the ESP building in the background. Back in the 1860’s it was decided that a new-fangled railroad to Atlanta would be built - right here. In fact, where the Richard Russell Federal District Courthouse stands just in front of the Elliott Street Deli & Pub was once the main train station for Atlanta, called Terminus Station. Back then, our building was operating as a Carriage House and Black Smith shop. (YES, this building was here BEFORE the railroad!). Copy of 1916 Atlanta Journal Constitution article about still raid. Fast forward to September 27, 1916 when the Federal Marshals raided the Carriage House and found an illegal operating alcohol still in the basement that now houses “the ESP 51” downstairs. (You can find a copy of the article about the 1916 bust from the Atlanta Journal Constitution of that day, on the wall in our Pub.) So, on September 27, 2016 we brought in a still and batched 10 gallons of moonshine and had a fantastic 100-year bust anniversary party! 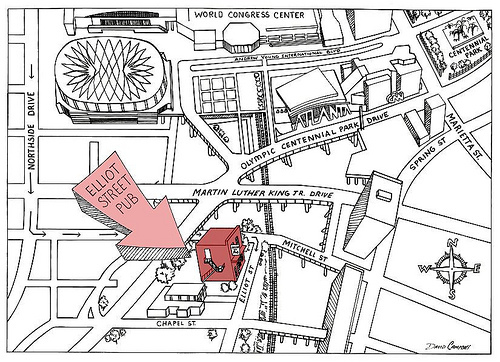 Then sometime around 1950, a gentleman named Alfred Smith bought 51 Elliott Street. With the train station in full operation - Norfolk Southern was running trains and trolleys up and down the street in front of our building - Atlanta was considered the bustling Capital of the South - and Elliott Street was smack dab in the middle of it. Mr. Smith, an African American man, then opened two businesses here. A Real Estate Company and an Insurance Company. He also dug out the basement by a few more feet and built an underground music club. Alfred would end up selling real estate and insuring some of the most prominent African Americans in Atlanta. Back then there was a music scene called the “Chitlin’ Circuit” which provided commercial and cultural acceptance for African American musicians, comedians, and other entertainers during the era of racial segregation in the United States. And many places which supported the movement stayed open very late and after hours….. The music would continue into the early morning hours, at churches, houses, or underground clubs (like the one here at 51 Elliott Street)…….(i.e. : The Bird Cage which we think was named after Charlie Parker “the Birdman”). From the stories we have heard - all second hand now, from siblings, to locals - many well-known musicians stopped by the `Bird Cage’ to play and relax. Many of them Alfred had found and insured houses for…. musicians like Curtis Mayfield, Glady Knight, Isaac Hayes and many other great players throughout the years as it operated as an “underground” Jazz Club. 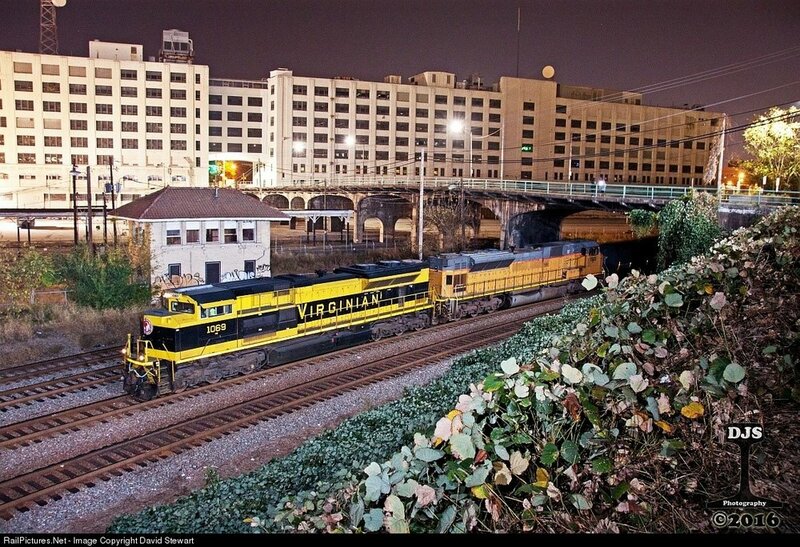 Trains running in 1970’s with Norfolk Southern building in background. Finally, the Terminus Railway Station closed in June 1970, and was demolished in 1972 with all its platforms removed and all the tracks covered by a parking lot. We don't know exactly when 51 Elliott Street turned into `Dee’s Bird Cage’ but we believe it was during the mid-1970’s - when the city became a place to work and not live - eventually closing sometime in the late 1990’s, a few years before the Brothers bought 51 Elliott Street. Today after well over a decade in business, incredible musicians and performers still adorn our stages…..and since we opened the Pub in 2006 we’ve also melted thousands of pounds of iron (at our world famous monthly iron pours); millions of photo’s have been taken here; dozens of Major Motion Pictures and TV series have been filmed here…...weddings have been performed here! Some of the most wonderful people have come thru our doors…….and we’ve even been awarded a Proclamation from the City of Atlanta making April 1st `Elliott Street Deli & Pub Day’ in the City! This citation hangs on our wall in the Pub downstairs and honors the effort of preserving this building and bringing life back to it again – just as in the hey days of when it was first established. ESP’s City Proclamation making April 1 ESP Day. Today, this lively building is still gathering great people, and good folks from all walks of life, from all over the world, to sit, listen and enjoy themselves while eating an exceptional sandwich, having a well-made drink and engaging in good conversation. We thank you for your interest and hope your stay will be comfortable, enjoyable and memorable! 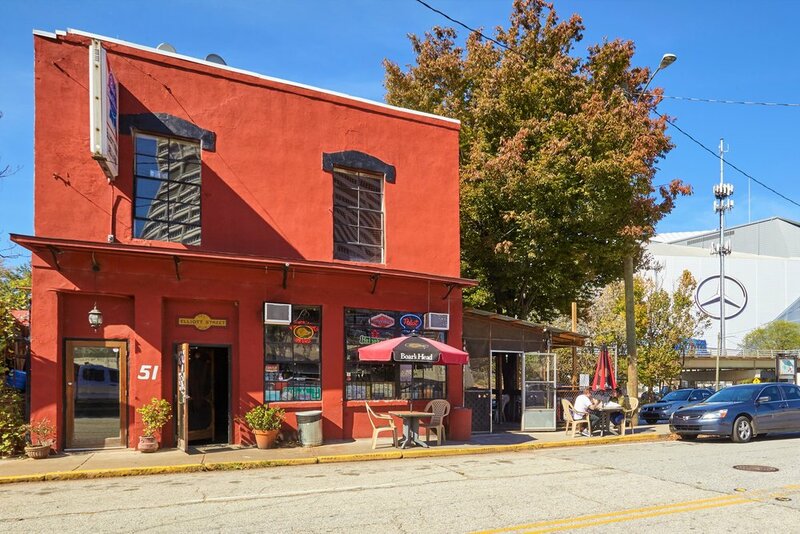 Please read through our welcome book for ideas on where to spend some downtime in Atlanta --- and we hope you can join us if you choose to for some of the activities, we have going on in our own Elliott Street Pub…. your first drink is on us!